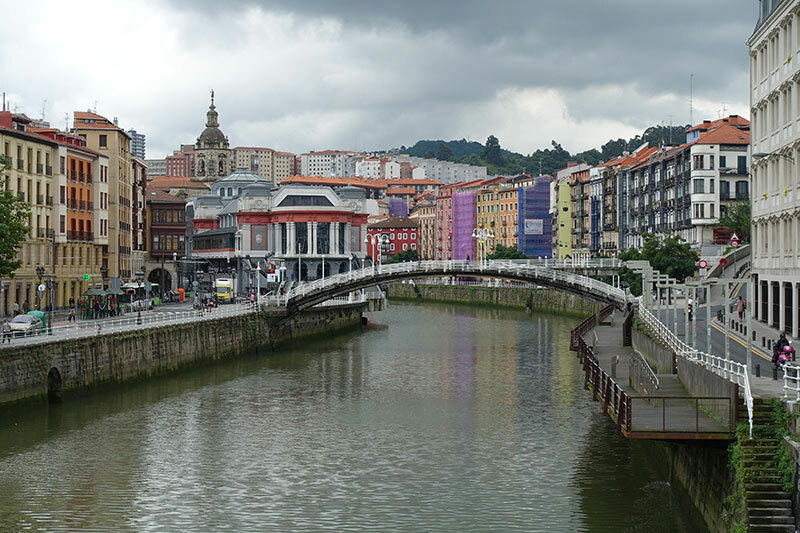 This is a First Timers Guide to Visiting Bilbao, Spain. 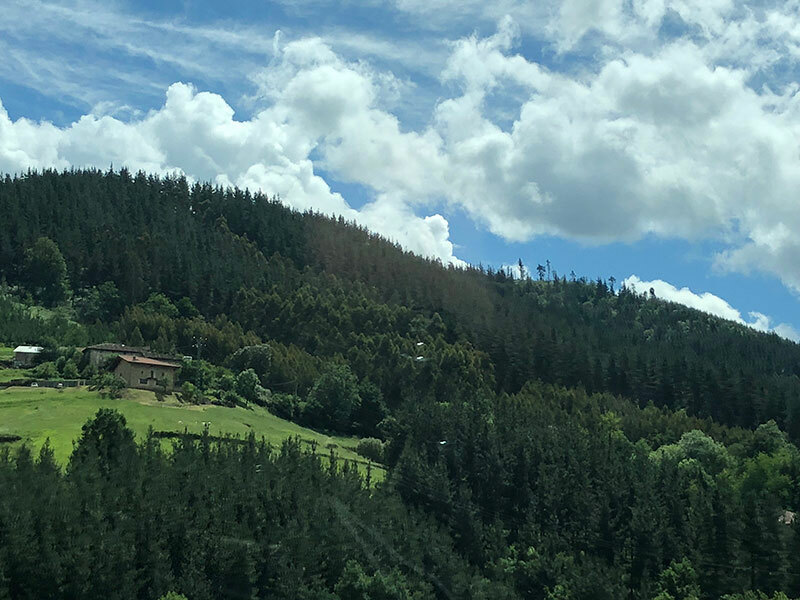 Just think Basque, think Guggenheim, think pintxos, think regeneration and you will understand that when we drove into Bilbao in Northern Spain through some of the greenest and lushest mountains, forests and pastures. I wondered if our GPS had brought us into Heidi country, it is that spectacular. 0.3 Why I wanted to visit the Basque country particularly. 1.1 How Bilbao regenerated itself. 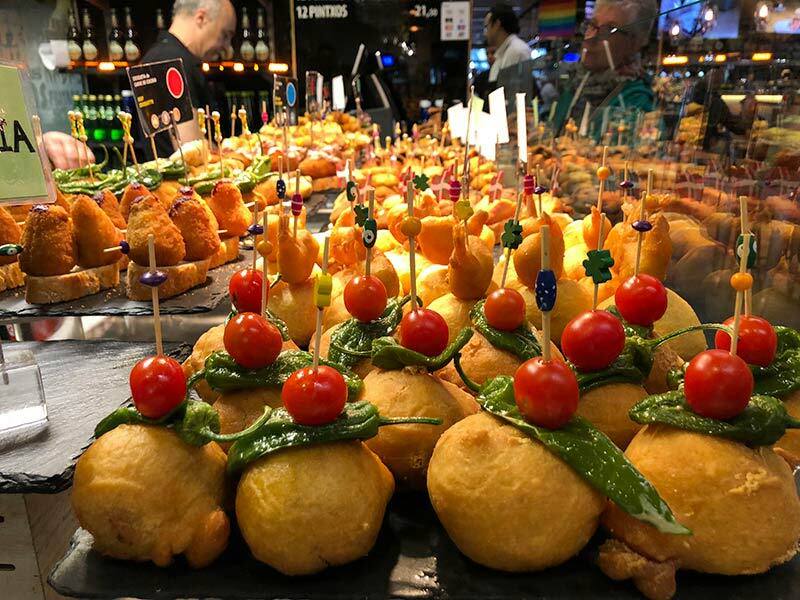 1.10 Gilda Pintxos are famous in the Basque Country. 1.11 Where to eat pintxos in Bilbao? 1.13 Eat Pintxos at Mercado de la Ribera. 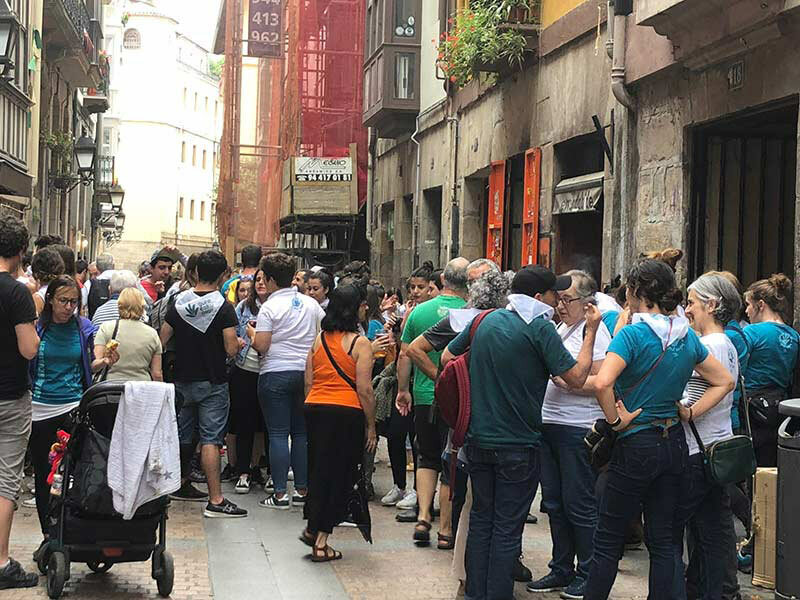 We entered the town of Bilbao, Spain, and of course we happened upon some demonstrations, protestations, parades and people were everywhere. Police had cordoned off roads and our GPS had just given up, it was that confusing. Perhaps it was the smell of the weed, or the explosions or whatever going off, but she/it was not having anything to do with helping us get to our hotel in the Basque city of Bilbao, northern Spain. We had no choice but to try to figure out what was going on and where we were headed. Undoubtedly it was harder for the driver, as I watched these celebrations occur; because like the GPS I had given up on my navigational duties to observe what was unfolding in this very intriguing city. This is Basque country and we knew that very quickly. On the day we arrived there was both celebrations and objections, yet a lot of merriment. ..and as we soon found out once we were settled and walking the streets. Bilbao knows how to party. The people were wearing scarves and t-shirts proudly declaring “gure esku dago” “It’s in our hands”. It is the right of the Basque people to decide their future. 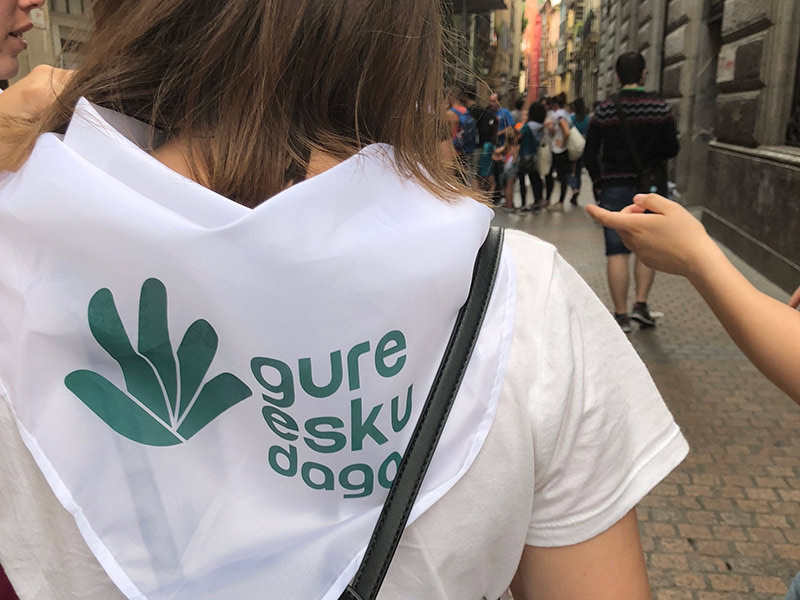 It was that day that tens of thousands of people from Spain’s autonomous Basque Country joined hands to form a 202 kilometre human chain, linking the cities of San Sebastian, Bilbao and Vitoria-Gasteiz – the seat of the Basque parliament, calling for the independence vote. What a day to arrive in this festive city. Why I wanted to visit the Basque country particularly. I had always wanted to visit the Basque country since reading, The Summer of Katya by author TREVANIAN when I was younger. Washington Post described it as “Part love story and part psychological thriller from best-selling author Trevanian, “a tour de force… A story that explores meticulously some of the darker corners of the human soul.” Read it. You will also feel compelled to visit Basque country. Currency: Euro – use xe.com to convert. A lot of ATM’s around. Driving: Right-hand side. Try not to drive down a cordoned off street where café patrons have to move their tables, as your GPS is stupid. Electricity: The standard voltage is 230 V, and the standard frequency is 50 Hz. 2 prongs. Get an international power adaptor. Don’t expect total sunshine all day every day. It rains in Bilbao, quite a lot, hence the greenery all around you. Always carry an umbrella, as the locals do. The temperature is milder than in southern Spain. Cost: Cheap, but more expensive than other places we had been like two of the most beautiful towns in Spain, Morella, and Albarracin but still very very cheap, especially compared with Australia. Click the links to discover why you need to add these prettiest towns in Spain to your must visit list. “Bilbao has two official languages: Spanish and Basque. 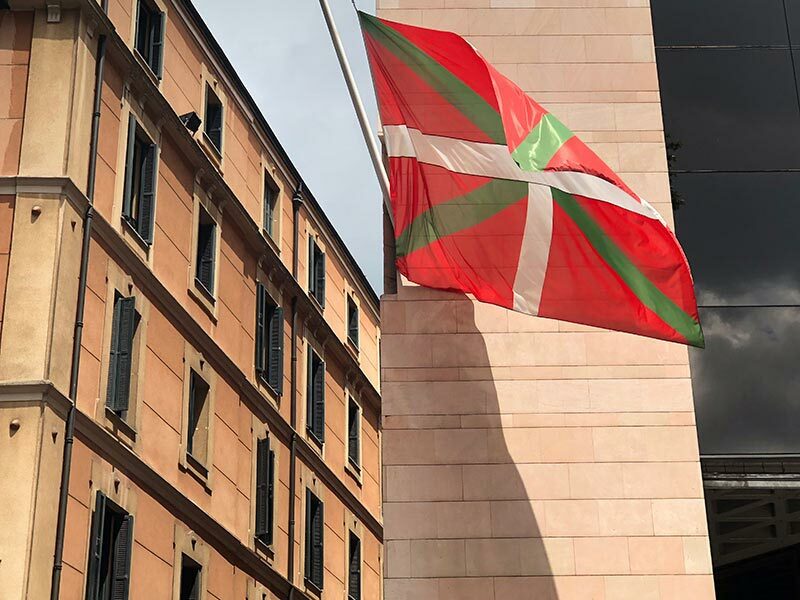 Both are used interchangeably in the administration and in the public services and increasingly more in everyday life, the result of the endeavour to mainstream Basque in recent decades.” Source. We didn’t understand a lot, but hands are a universal language. Look at the road signs and expect to see a language very different to the rest of Spain …lots of ‘x’s’ in names. • Siesta is a very real thing in Bilbao, so expect many places to close at 2pm, and wake up again, anywhere between 5pm and 8pm. • Don’t go out for dinner until at least 8pm at the very earliest. 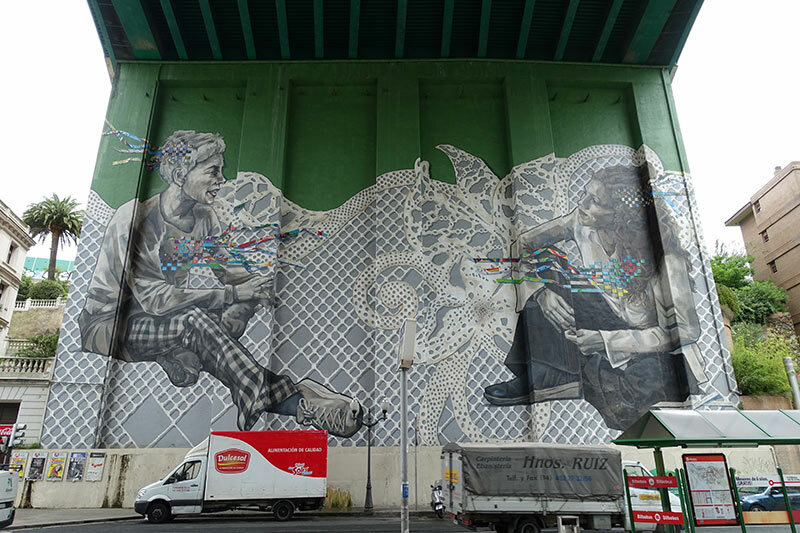 Two decades ago, Bilbao in Northern Spain, was a Basque city port in post-industrial decline. During the 1980s, the city’s industries of iron, steel, and shipbuilding were deteriorating rapidly. There was not a lot to attract tourists to this rather dour and uninspiring port city of Bilbao. In 1991, the local and Basque governments suggested to the Solomon R. Guggenheim Foundation that it would fund a Guggenheim museum to be built in Bilbao’s decaying port city, to revitalize it. 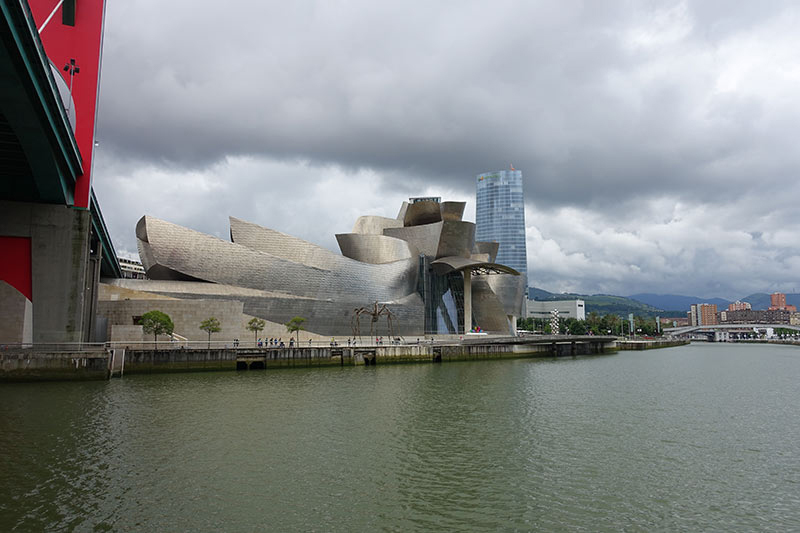 The Basque government would cover the construction cost, create an acquisitions fund which would pay a one-time fee to the Guggenheim and subsidize the museum’s annual budget. In exchange, the Foundation agreed to manage the institution, bring in some of its permanent collections on a rotational basis through the Bilbao museum, and organize various temporary exhibitions. Well what a raging success this became. Architect Frank Gehry was successful in being awarded the contract to design the Guggenheim Museum of Bilbao. 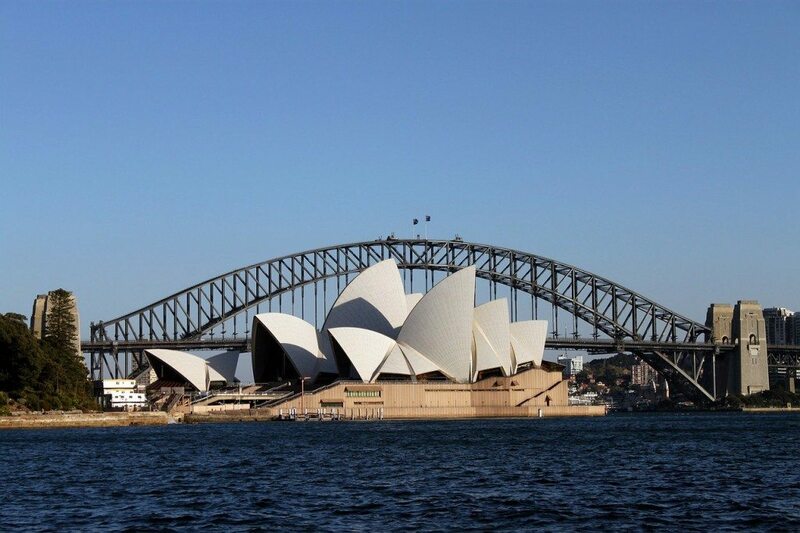 He was told, ‘Mr Gehry, we need the Sydney Opera House. Our town is dying.’ You can read more about the Sydney Opera House and how it was a controversial construction also. 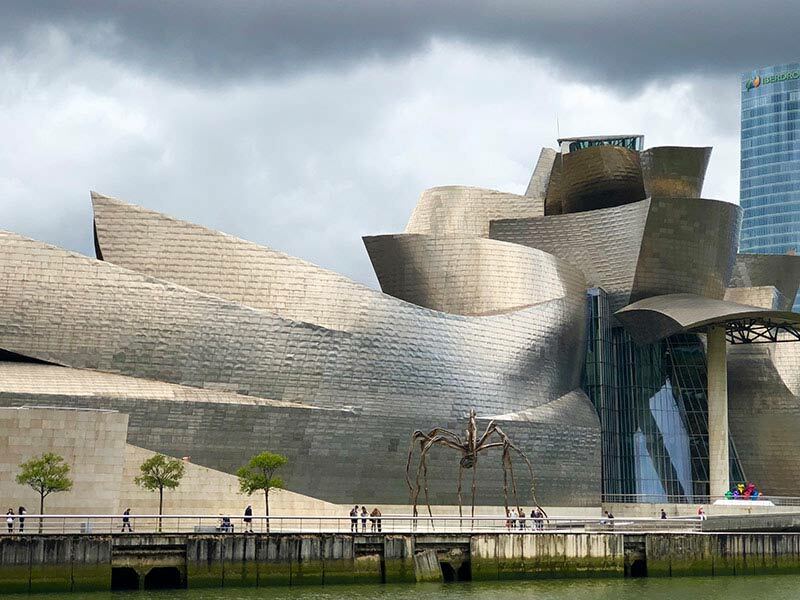 Not devoid of controversy, much like the Sydney Opera House, the Guggenheim Museum of Bilbao opened in October 1997 and Bilbao was back on the map, albeit for different reasons. This was a tourism-driven strategy. It has been called the “Bilbao effect”, where a cultural investment, avant-garde architecture, incredible collections, all resulted in an economic upturn for the Basque city of Bilbao. The Guggenheim Museum created a domino effect in this now buzzing city. 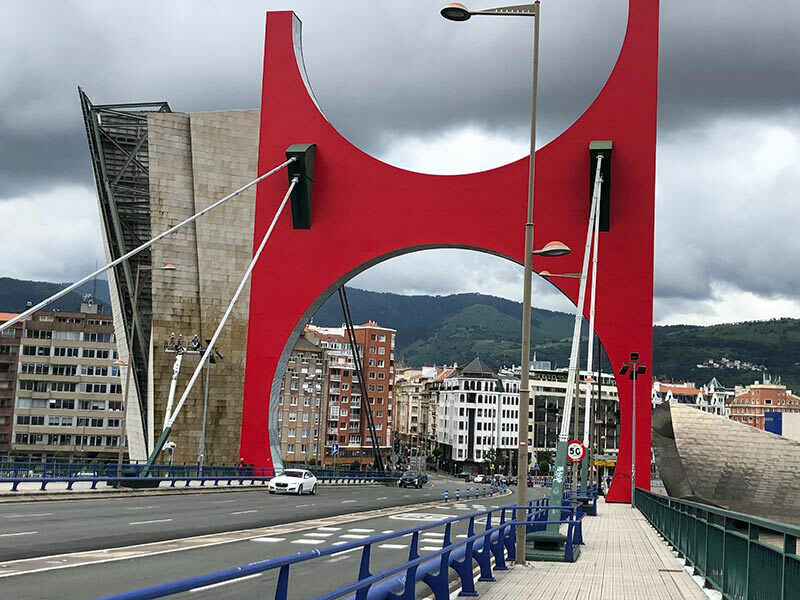 The Zubizuri (Basque for “white bridge”), was designed by architect Santiago Calatrava. The bridge links the Campo Volantin right bank and Uribitarte left bank of the river. The Nervión River winds through the city, with the Casco Viejo, the old town at the eastern edge of the centre on the river’s right bank. 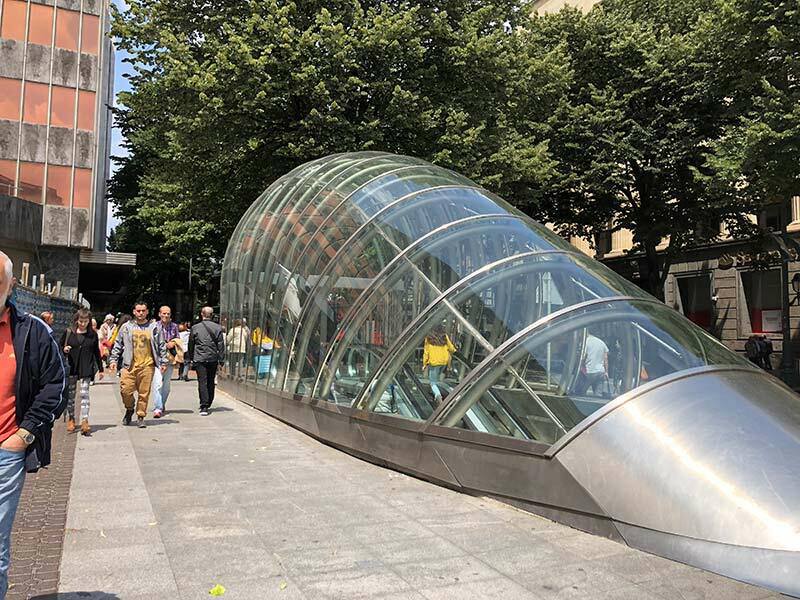 The impressive Bilbao Metro was designed by Norman Foster; and Azkuna Zentroa, (originally called AlhóndigaBilbao until 2015) established a cultural centre, designed by Philippe Starck, in an old wine warehouse. 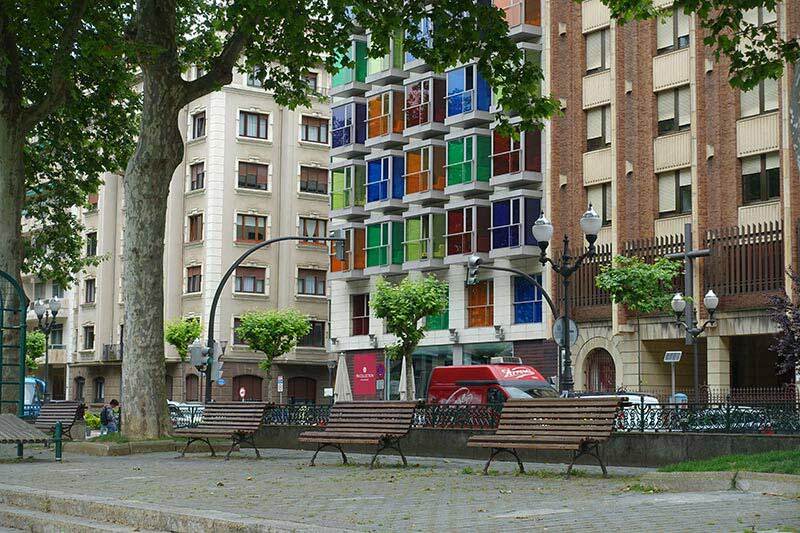 There has been a reinvention or regeneration of Bilbao through architecture. Yet it didn’t stop there. The Old Town or Casco Viejo cleaned itself up. The evidence was there in this thriving, bustling hove of cafes and restaurants, many around the Gothic Santiago Cathedral and Plaza Nueva, and also along the narrow little cobblestones alleys, where it is still not unusual to see men relieving themselves behind dumpsters, and in corners etc. 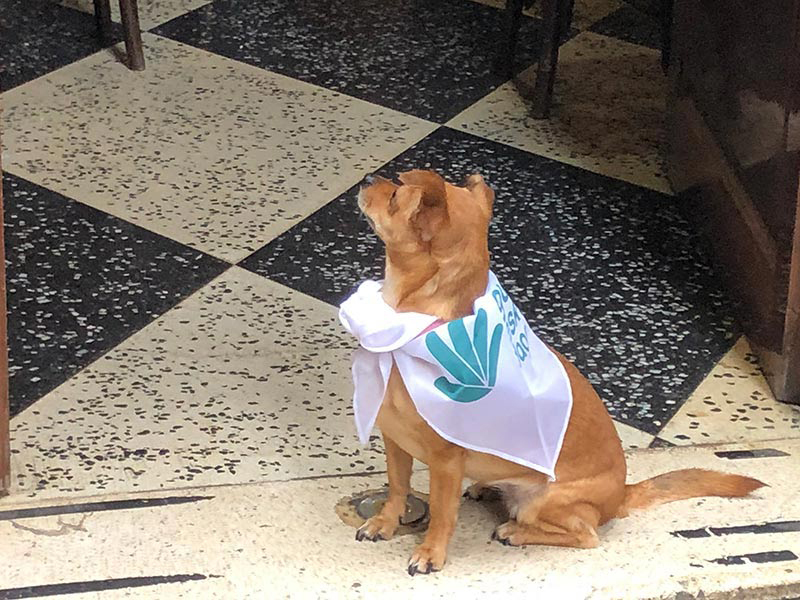 There is no doubt that the pride of the people in their city of Bilbao and of the Basque region has never wavered; regardless of what state the city was in. The day we arrived we saw ample evidence of this pride, and it was infectious. Bilbao, Spain is a very attractive city with the river running through it, plane trees lining both sides of the river and a very generous promenade. There is greenery all around, as well as both old and new architecture that makes the city very interesting. It is an easy city to walk around, and a lot easier than driving due to the many one-way streets that change their minds quite often. Bilbao is also pintxos territory, and therefore a gastronomes delight. Wine and beer flow all day and all night freely, and the city has a very relaxed and ‘cool’ vibe. Bilbao looks and feels very good. Of course, you cannot miss the Guggenheim Museum, and nor would you want to. It looks like a huge, albeit abstract, metal ship, floating down the River Nervión. Note, it is closed on Monday. 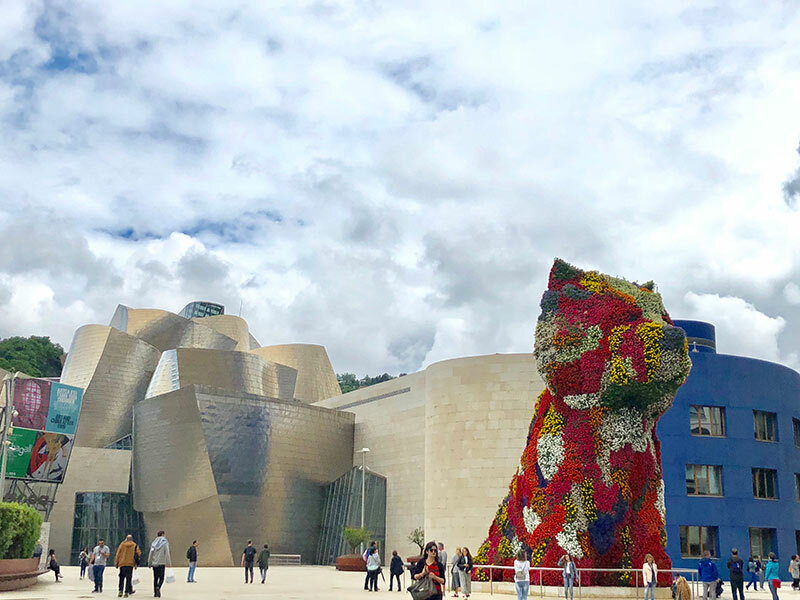 You cannot miss seeing “Puppy” who guards to entrance to the Museo Guggenheim Bilbao. We love Puppy. 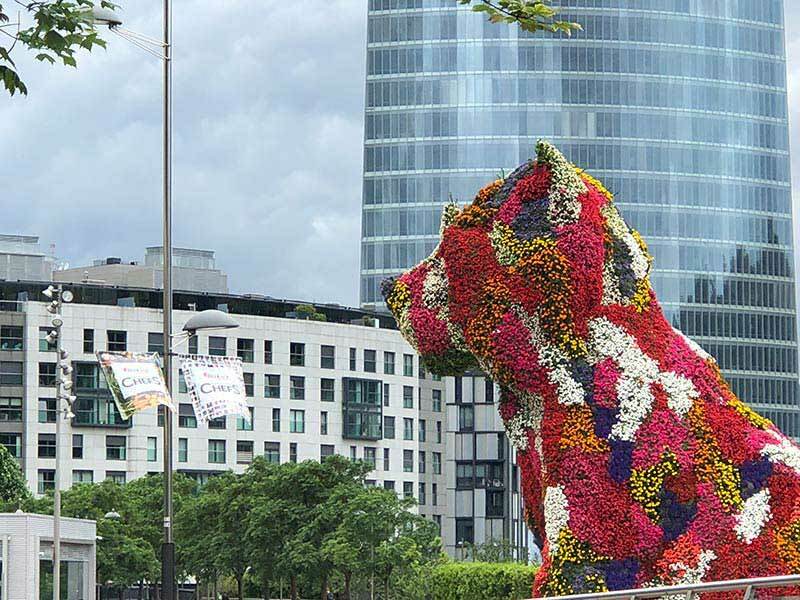 Puppy was designed by Jeff Koons, and is a huge beautiful topiary dog, coincidentally “underwritten” by Hugo Boss, a German luxury fashion house. This led to further issues in Bilbao with many people believing that the city had sold out to commercialism. However, nothing has been easy, “A few days before the Guggenheim was opened in 1997, the museum was nearly bombed by three ETA Basque separatists posing as gardeners working on the sculpture. The men carried flower pots filled with 12 remote-controlled grenades. Unfortunately, in the ensuing battle, a local policeman Jose María Aguirre, lost his life. The plaza in which Puppy now resides has been renamed in honour of Aguirre. Source. 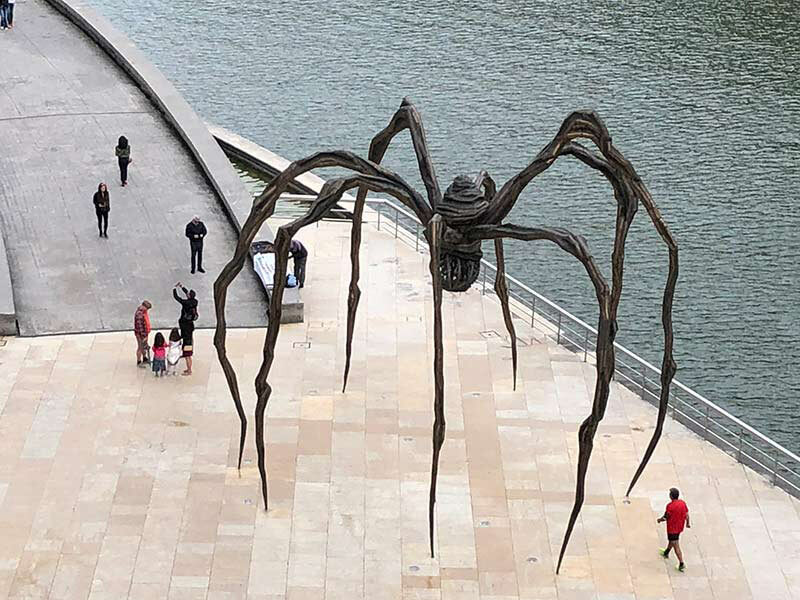 Created by Louise Bourgeois, the giant spider sculpture reflects both protector and predator. With silk used to both build cocoons as well as to bind prey, Bourgeous’ art embodies strength and fragility. Read more about the woman behind the spider. 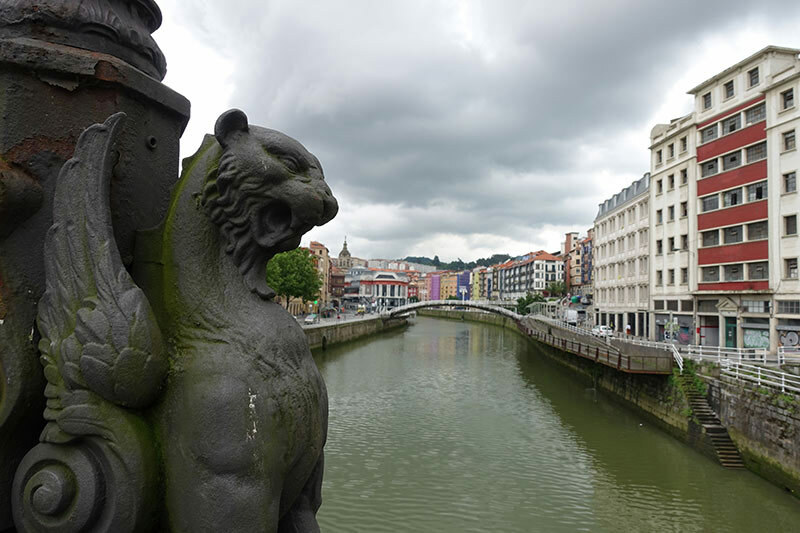 There are many other museums in Bilbao including the Fine Arts Museum, the Archeological Museum, the Maritime Museum and the Bullfighting Museum. One of the best things about Bilbao is its mix of old and new architecture. The Santiago Cathedral, located in the centre of the city, is considered Bilbao’s oldest building. It was constructed during the 15th century. Visit for the chic gothic architecture, arched ceilings and doorways, and towering spires, before exploring the rest of the tiny streets of Casco Viejo. if you want to learn more about all things Euskal, the Basque culture, go to the Euskal Museoa. Visit the apex of Artxanda Mountain after breakfast. Don’t worry, you won’t have to climb up the mountain – there is a funicular railway that will bring you to the top. 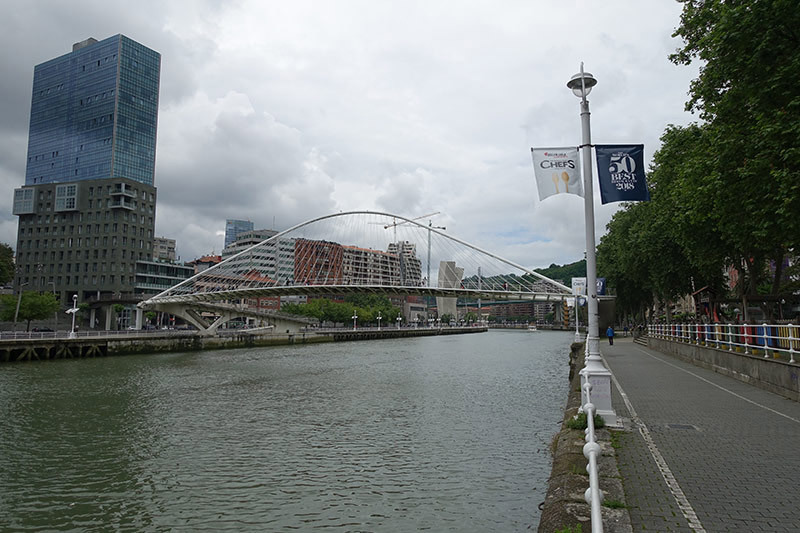 As Bilbao is divided by the River Nervión, bridges have been essential to the city in uniting both sides. While an industrial city, the bridges had to allow the river traffic to flow freely and linking both sides of the river has always been important. 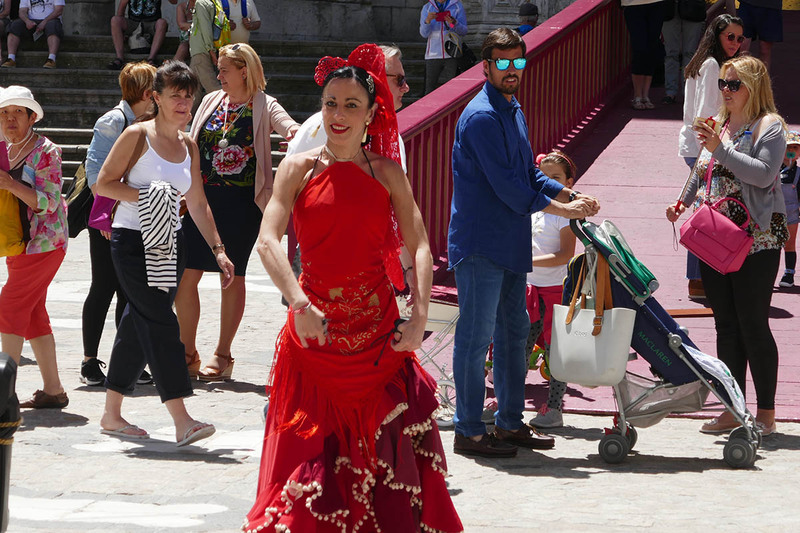 You will see Zubizuri on your way to the Guggenheim Museum, as well as La Salve Bridge. The official name is the ‘Prince and Princess of Spain Bridge’. It was built in the early 1970s to connect the heart of the city with the suburbs, and now it also links up with the Guggenheim Museum Bilbao. On the tenth anniversary of the Museum, a great red gate by the French artist Daniel Buren called “L’arc rouge” (The red arc) was opened on the bridge. 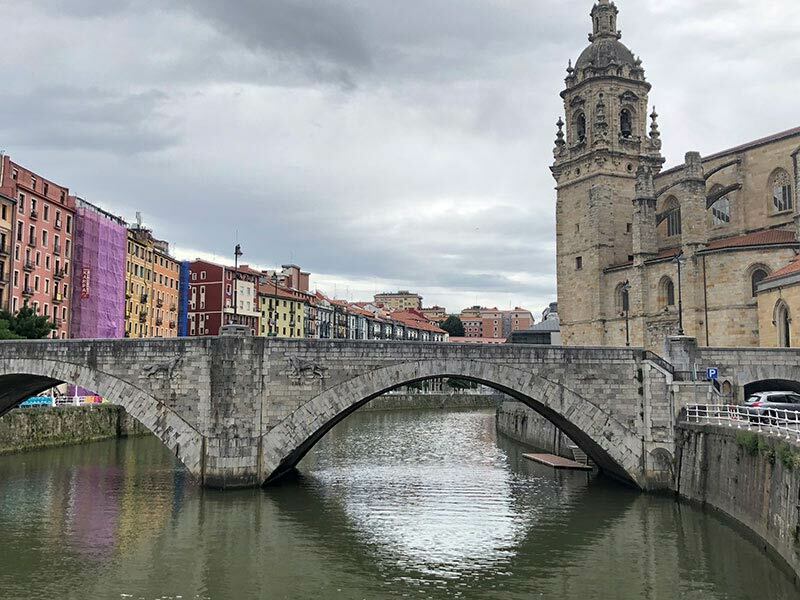 Go west of Bilbao, to see the UNESCO heritage listed, Vizcaya (Bizkaia) Bridge designed by the Basque architect Alberto de Palacio and completed in 1893. 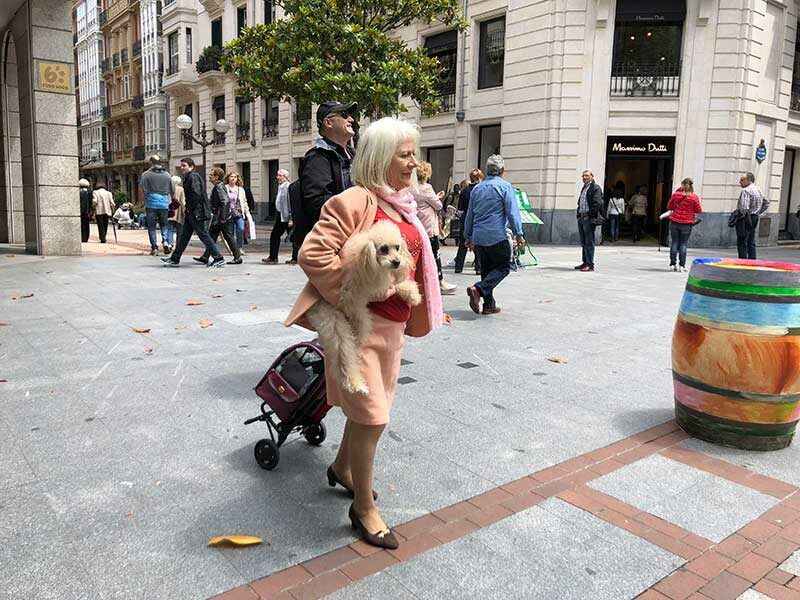 The city is full of cafes, churches, like Iglesia de San Antón, theatres, beautiful parks like Parque Etxebarria and Parque Doña Casilda de Iturrizar, where the fountain that dances to the music to the magnificent and flat river walk from one end of town to the other. Pintxos are served everywhere in Bilbao and throughout the Basque country. It is pronounced, ‘pinchos.’ It comes from the word ‘to pierce’ because generally, but not always, the topping is on a piece of bread with a cocktail stick. Pintxos are usually slices of bread topped with anything from tortilla to salt cod, jamon to cream cheese and anchovy, and everything in between. They are works of art. They are never called ‘tapas’ in Basque country. There is an art to pintxos eating. Mostly you get a little messy, and that is ok. It is called pintxos grazing and means you start at one place with a drink and a Pintxos, and then keep moving from one place to another for more pintxos and more drinking. 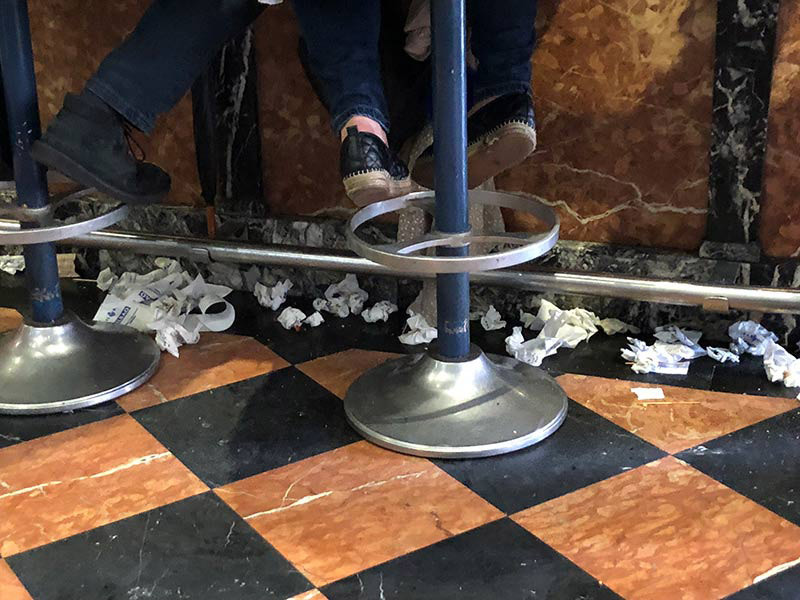 As an aside, it is totally acceptable to drop your napkin(s) on the ground or the floor of the café when you have finished your pintxos. Ok, we couldn’t do it, but the locals sure do. Also, always return your plates and glasses to the counter. It is what the locals do, and you should too. 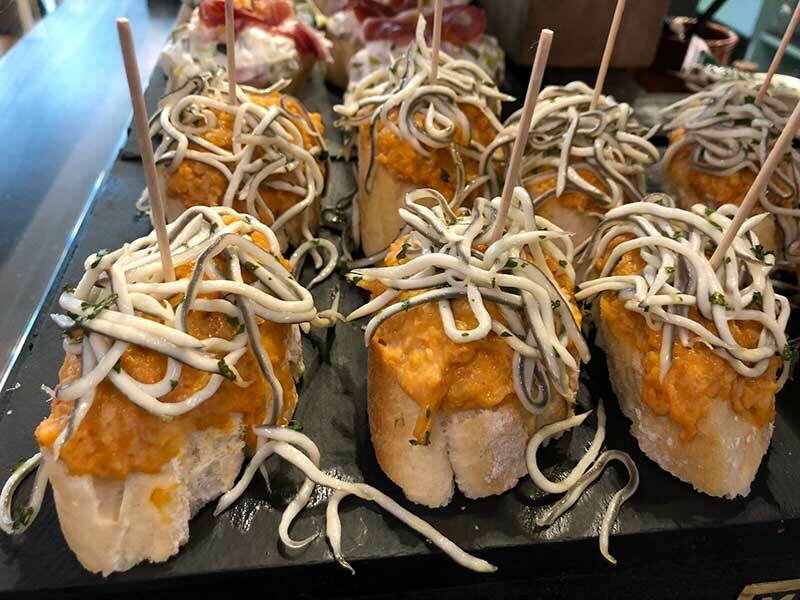 Gilda Pintxos are famous in the Basque Country. 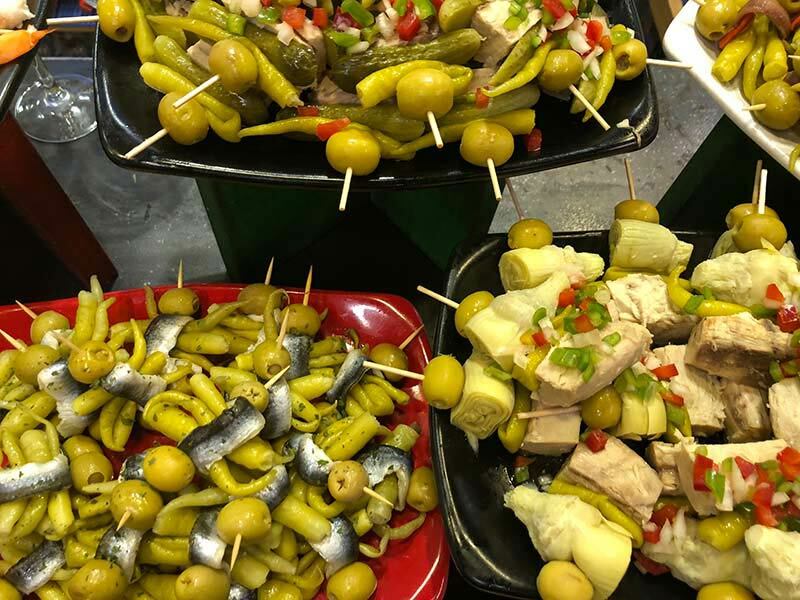 One of the most iconic pintxos in Bilbao and the Basque Country is the ‘Gilda’, consisting of green olives, gherkins, Spanish pickled green chillies and some salted anchovies. The dish got its name from Rita Hayworth’s femme fatale character in the movie ‘Gilda’. PS – delicious. 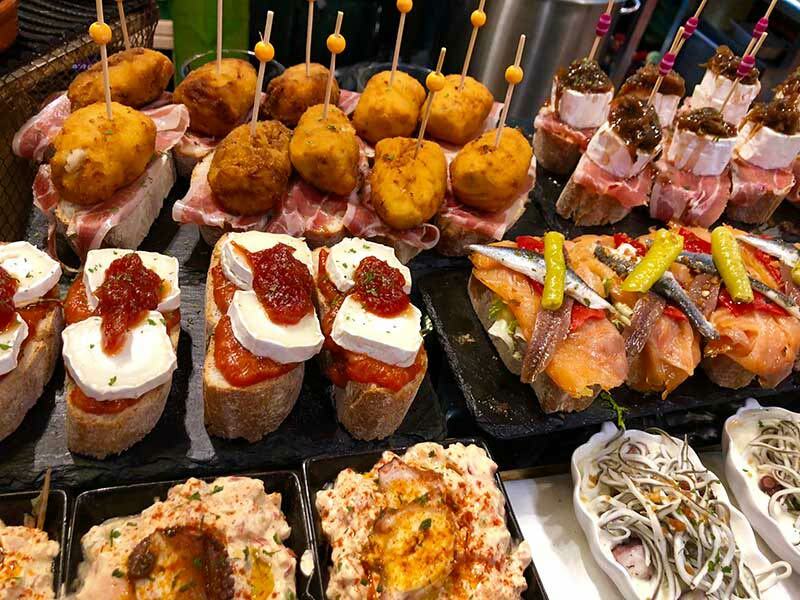 Where to eat pintxos in Bilbao? Bilbao’s Old Town, known as Casco Viejo, is made up of 7 picturesque streets. This is where you’ll find the most authentic Pintxos in Bilbao and where you should definitely embark on a ‘Pintxos crawl’. 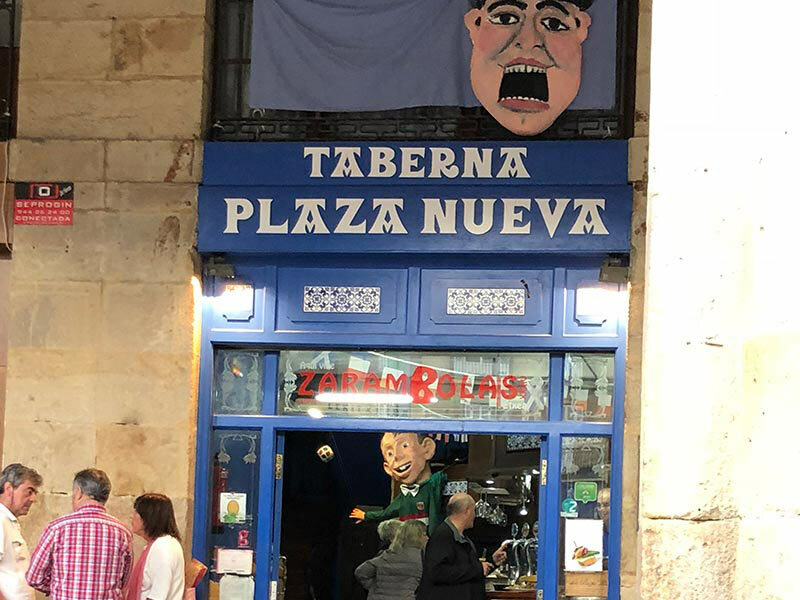 Most people will start in Plaza Nueva, a Neoclassical square lined with bars serving the Basque version of tapas, which comes alive at weekends and after 8pm every night. It doesn’t matter where you are in Bilbao, you will find pintxos, and friends gathered to drink, and to eat. It is hard to go wrong in Bilbao with pintxos. Plaza Nuevo is in or very close to the Casca Viejo…really it is a part of the Old Town and frequented by both locals and tourists. With a main square in the middle it is ideal for kids to play. Surrounded by the white shuttered neoclassical apartments, it is nice to see the people living there and watching all the action in the plaza from their balconies. Many of these places are closed on Monday or shut early. It pays to go out for dinner a little earlier on a Monday. While Ereka gets mixed reviews, we could only judge it on how we found it, and that was excellent. From my fumbled attempts at ordering in Spanish .. I should have attempted Basque, possibly the oldest language in Europe, (read more here) but the service was nothing short of helpful and delightful. The owner figured out what I was trying to order, and made it happen. 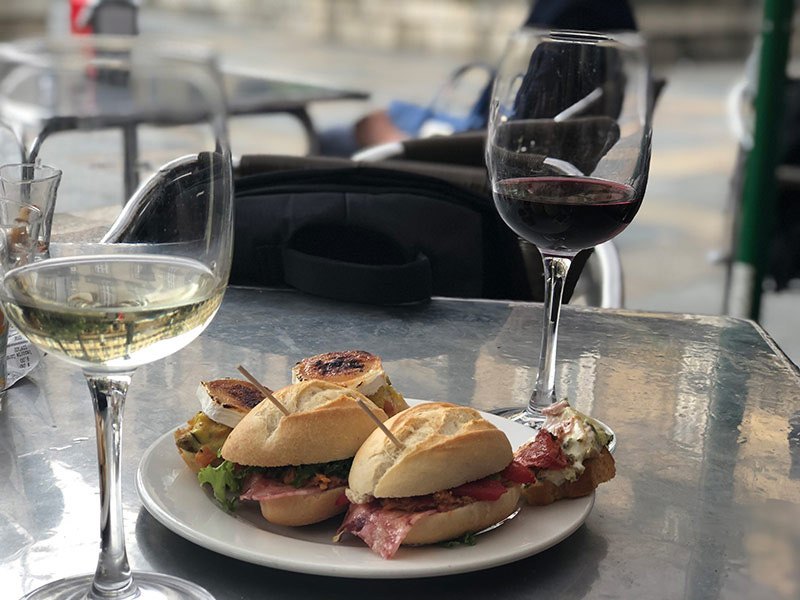 We found the pintxos, the wine and the ambience to be a great introduction to this fascinating city. Great service from the owner who explained every single pintxos to us that was on the counter. Very authentic and friendly. The food was homemade and delicious especially the pork and the scallops. Great value for money, and a great atmosphere. Loved it. Lots of fresh and delicious pintxos, that are works of art. Service was amazing too. Winner of 2016’s best pintxos bar championship, it is a classy place with some amazing pintxos. Opened since 1911, Café Bar Bilbao is an institution, and was my least favourite, as this was the only time I ever got a soggy pintxos, which I am thinking is near sacrilege in this Basque country. 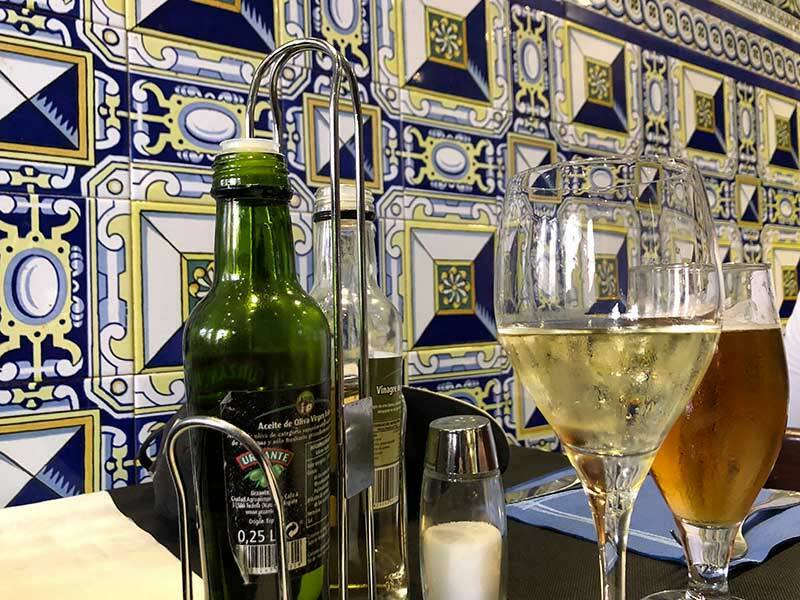 The café does have beautifully tiled walls. You will read many great reviews about it, but not from me. Eat Pintxos at Mercado de la Ribera. The Mercado de la Ribera, is located on the banks of the Nervión river and is the biggest indoor market in Europe. It is located in a restored Art Decó building with stained-glass windows in Casco Viejo, or the Old Town. Not only can you see all of the fresh produce, but they have pintxos bars where you can eat and drink to your heart’s content. We totally recommend the café Vermuteka, which you will find as you come up the escalators and on your left. The food was fresh, constantly being updated, the service amazing and the pintxos incredible. Great coffee, orange juice and wine also. Good for breakfast, lunch and early dinner. Mercado de la Ribera is open Monday-Thursday 8am-2pm and 4.30pm-7pm, while on Fridays it stays open until 7.30pm. On Saturdays it is only open in the morning. The Euskotren Tranbia is a green tram that runs on only one line, in two directions. It costs about 1.50 euro and is a great way to see this small city along the left bank of the Nervión River. It goes to the Guggenheim Museum also. I used this site as a source for this information. At night it is a good idea to use taxis for convenience and speed. Taxis can be found every day at any time and are white with their license number and a red stripe on the side. Radio Taxi Bilbao (+34 944448888). Great position and fabulous views of the museum. Location. Read TripAdvisor Reviews and get latest prices here. Located on the river, this is a very arty hotel midway between the Guggenheim Museum and the Old Town. Read TripAdvisor Reviews and get latest prices here. Staying in the narrow streets of the Casco Viejo (Old Town) is always appealing. Hotel is located in the heart of Casco Viejo, close to restaurants, bars, the markets, and the river. Atmosphere. Great Value in Great Location. Lots of return visitors so must have something going for it. Abando is the most central district in the city and its most ritzy also. Indautxu is west of Abando, and a very central location. Here you will find Azkuna Zentroa, the culture and leisure centre. A nice hotel very close to the main restaurants and shopping streets of Bilbao. Modern, well equipped, clean, friendly staff and owner, excellent location. Bilbao in Northern Spain regenerated itself and did a mighty fine job. It is the place to visit, because it is vibrant and a mix of the old and the new. It is Basque country and you know it. The Guggenheim and many other famous landmarks are here, but it is down on the ground where the pintxos bars are pumping that you really get a feel of this amazing city. We hope that this First Timers Guide to Visiting Bilbao, Spain is handy. We highly recommend you visit Bilbao.